What can explain the success of Mauritius? Until 1968, the country was a British colony, with a heavy dependence on sugar exports, when research has shown dependence on primary resources to be linked to increased inequality and poor-quality institutions. Mauritius is a melting pot of ethnicities and religions, when, again, ethno-linguistic diversity has been linked in the literature to poor growth and conflict, particularly in Africa. The island’s geographical location is remote, meaning that accessing world markets and ideas is expensive. Isn’t this a recipe for political and economic disaster? Not in the case of Mauritius, and the small island may have some lessons for the rest of the world. Ethnic diversity, for instance, has not led to war and poverty. It could be that the small size of the country forces different ethnicities to live peacefully, as they must interact with each other on a daily basis. Strong democratic institutions have ensured that population diversity is a blessing rather than a boon. Of course, this raises the question where democratic institutions come from. British colonial legacy could be one explanation. But what is crucial is that the country’s politicians have (correctly) realized that growth cannot happen without a democratic commitment. And indeed, political stability and the absence of conflict have attracted many investors who operate in Africa but are based in Mauritius (together with its status as an offshore zone). The second lesson has to do with education. Both the primary and secondary education system are very competitive, with top students (ranked nationally) after secondary school guaranteed scholarships to study abroad. In 2015, close to 50% of all population aged 20-24 was enrolled in tertiary education, and 23% of these students were studying abroad. What is more, the Mauritius government has recently introduced a Mauritius diaspora scheme which aims to attract highly-educated Mauritians residing abroad to return to Mauritius, which includes, among other incentives, exemption from income tax for ten years. 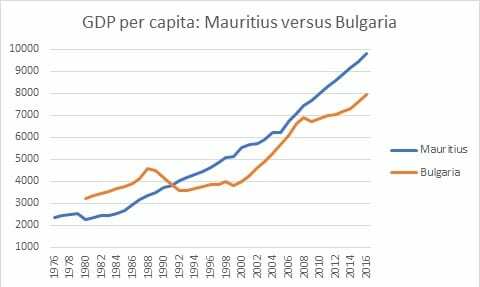 Finally, rather than turning its small size into a hindrance, Mauritius has embraced it and exploited it through openness. The Mauritian growth strategy takes advantage of what the rest of the world has to offer. When much of Europe is gripped by fiscal austerity, Mauritius is building a new 26-kilometer light rail, in collaboration with the government of Singapore. It has tax treaties with 43 countries, and bilateral relations with China are strong. For instance, China is providing technical expertise to develop the state-owned television station, the Mauritius Broadcasting Corporation, along with interest-free loans. And of course, those Mauritian beaches are not bad at all, as I can certify from personal experience. Until 1990, many of Bulgaria’s Black Sea resorts were off limits to mere mortals, and after the fall of communism, hotels were quickly privatized. This was largely done on a ‘piecemeal’ basis and the new owners, unsurprisingly, came from the old (and now new) political elite. Resorts such as Golden Sands became overpopulated and overbuilt. Disclaimer: The views expressed in this piece are those of the author only (in a personal capacity) and do not reflect those of any organization. Further reading on Bulgaria: Nikolova, E., & Marinov, N. (2017). Do public fund windfalls increase corruption? Evidence from a natural disaster. Comparative Political Studies, 50(11), 1455-1488.